You may not realize you have unconscious bias. All of us have unconscious biases affecting the way we react to one another fairly and justly. I’ve witnessed it from time to time and even more so recently. 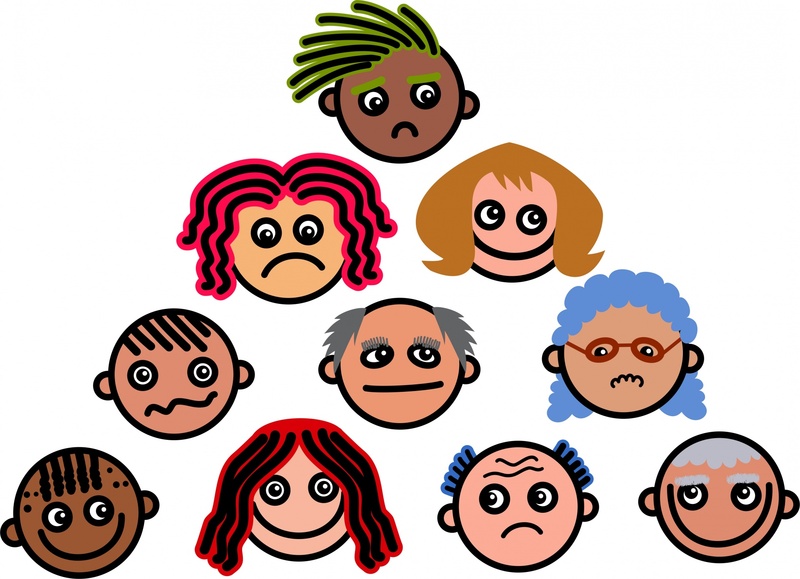 I have had clients throughout the years confronted with biases about a) color b) age or c) ethnicity. Because I have been talking about issues impacting negatively on ex-offenders, people of color, women, disabled, and other groups, I have garnered more attention. Since speaking to groups treated like 2nd class citizens, my show’s downloads have decreased. Good. I do not pander to or wander from my goal: to be The Voice of (ALL) Job Seekers. Don’t over react. Race is a big part of the discussion and doesn’t mean you’re a racist based on recognizing unconscious biases. 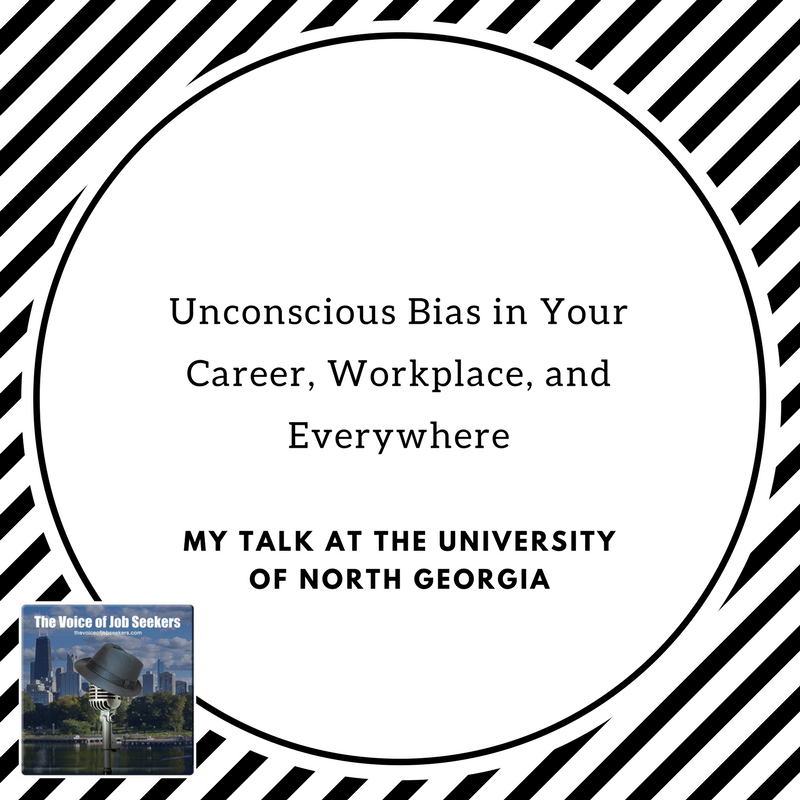 I was asked to come to the University of North Georgia to talk about “Unconscious Bias” due to my Facebook postings on diversity and inclusion. I have been studying and noticing how microaggressions (the result of unconscious bias) emasculate job seekers. Many young people (especially of the aforementioned) who are assaulted with hurtful assumptions way before his/her first job interview. I recorded an excerpt from my talk at the University of North Georgia on unconscious bias. I wish I had a day to bring training to a complete circle, but grateful to introduce the idea of promoting amicable and respectful dialogue around the affect of bias. Here is the link to the show and notes. You can also subscribe to the podcast on iTunes here. I am open in talking more about this subject (like all of my articles) offline. If you want to contact me, please call me at 708-365-9822. If you would like for me to present at your organization or college, email me at mark@thevoiceofjobseekers.com. I will gladly consider facilitating a discussion on this topic in any format you’d like. 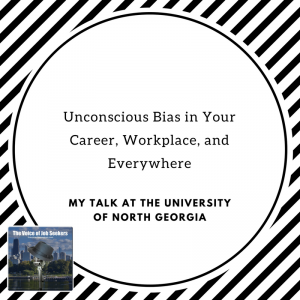 Last week, I traveled to the University of North Georgia to present a talk about “Unconscious Bias.” I recorded it so I can share it with you at least a part of it. I talk about how it affects everyone in their career, life, and workplace. This is an important topic to me as it affects the job search. In the end, I hope we can create amicable and responsive dialogue to take out bias in the job search process. Go to TheVoiceofJobSeekers.com, press “Send Voicemail” button on the right side of your screen. During my talk, I discuss how a safe environment to make the unconscious “conscious” was key. I posed the question as a theme how can we have respectful and amicable dialogue during the process. 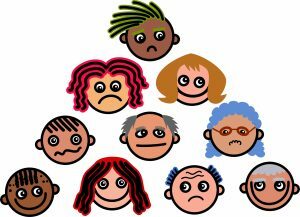 Everyone must feel alright about working through the language of bias and dismantling differences. Since my talk targeted the Student Affairs division and students, much of it was for them. My total talk was approximately an hour and a half. If you’re in Chicago, you might be interested in my live event on February 12. Tony Chatman is my guest and we will discuss “Unconscious Bias” and how it affects your career. We will also stream it on Facebook Live if you go to The Voice of Job Seekers Facebook page about 2pm CST. If you want to join me, send me a note. Send it to mark@thevoiceofjobseekers.com or call 708-365-9822 for more information. You can text me at that the same number and I will respond. When you’re searching for a career, touting your diversity is probably not the first thing that comes to mind. In fact, many diverse individuals used to and still do purposefully hide their ethnicity or race because they don’t want to be hired because of their skin, or gender, or culture; they want to be hired for their skills, their knowledge, their experience, their capabilities. Likewise, let’s face it, they are still afraid of not being hired because of who they are. The thing is though that as a diverse individual, some of your knowledge, experience, and capabilities are inextricably tied to your heritage or background, and it’s not always bad to own those aspects of your professional repertoire. In fact, now is the time to show potential employers just how much your diversity matters, and that it matters more now than ever. Why? Almost 40% of the population is made up of minorities currently and that percentage is growing annually (US Census Bureau). If the population were to be correctly represented in the workforce, 40% of employees at any company should also, therefore be minorities. This is not the reality, however. In fact, there is a need for equal representation in most of corporate America. Without proper representation reflecting the population, companies currently face a deficit of knowledge and will begin to lag in their ability to appeal to a market they don’t understand. Following a market segment is something companies spend billions on and having key players who are representative of those market segments is invaluable. Spending more money on surveys will only get them so far; they need people, real people, who can speak to their audiences through marketing, product development, and tailored services. Hence, sell your ability to understand a segment of the population you are a part of; own your market segment. Even brush up on what you need to know about the culture you represent so that you can feel comfortable selling yourself as a representative of that population. And yes, being a woman, LGBTQ, any race or ethnicity, disabled, or any other unique category counts, because each offers a diversity of ideas. With the new age of mass media and fast news, companies are under tougher scrutiny than ever. Many people go to social media to complain now — making these complaints available to the world immediately. Also, news outlets use citizen reporting and tips more than ever. So now a company’s integrity can be questioned and make headlines overnight. Tech businesses in Silicon Valley got flack in 2016 for lack of diversity. Bad press is not good for business, and so many companies are now scrambling not to make the same mistake and get bad press for the same reasons. But ensuring your business’s staff is diversified, including at a senior and management level, takes time, effort, an attractive company culture, good recruitment strategies, and an inclusive atmosphere encourages employees to stay and move up. You need to help businesses see why they need this, even if they haven’t fully understood it yet. Be a pioneer. And if they know why and what they are looking for, let them know why you’re the talent they have been waiting for, fitting and driving an inclusive potential culture like a glove. Because of #1 and #2, many employers now know that they need to fill a diversity quota as a PR disaster avoidance technique, but they also are seeing the positive stats coming out about diverse teams and company overhead. Either way, they want diversity and want to know you will fulfill that bar. This is a hard one for some because people want to be hired for more reasons than simply fulfilling a quota, but sometimes whatever gets you in there, allows you to prove yourself, and prove to them why they do, after all, need diversity. Use it as a chance to show resilience instead of taking offense to their lack of knowledge and understanding. President Obama recently said in his farewell address “…there was talk of a post-racial America. Such a vision, however well-intended, was never realistic. For race remains a potent and often divisive force in our society. I’ve lived long enough to know race relations are better than they were 10, or 20, or 30 years ago — you can see it not just in statistics, but in the attitudes of young Americans across the political spectrum. But we’re not where we need to be. All of us have more work to do. After all, if economic issues are framed as a struggle between a hard-working white middle class and undeserving minorities, then workers of all shades will be left fighting for scraps while the wealthy withdraw further into their private enclaves. Those brown kids need to see you hired. You need to help usher in a new era by helping employers understand the incoming majority. The sooner a workplace integrates and learns to be inclusive, the easier it will be for them to welcome the talent and uniquenesses of diverse teams. Company culture is an “it” topic currently, and you have an opportunity to be part of the molding of that. Most importantly, don’t doubt yourself. For years minorities, women, and other disadvantaged groups have faced ceilings in the employment world. Madeleine Albright once said, “there is a special place in hell for women who don’t help other women.” In other words, women are already disadvantaged enough and therefore should not further the disadvantage by critiquing other women. Essentially, women should not doubt each other. This thinking applies not only to all minority groups supporting each other, but also applies to supporting one’s self. There are enough doubters and “haters” out there, so don’t add yourself to the list of the adversaries you will face. Be proud and be bold and own that uniqueness and diversity, no matter what shape it comes in. Now, just as much as ever, your diversity is an asset. Cherise Tolbert enjoys being an influencer among diverse job seekers across the country as the Social Media Manager for LatPro, Inc., an award-winning employment website network working to connect diverse, Hispanic, and bilingual job seekers with employers throughout the Americas. Cherise has her Master’s in Media Studies from the S.I. Newhouse School of Public Communications at Syracuse University and a BS in Public Communications with a minor in Community and International Development from The University of Vermont. She has worked in communications for almost a decade including in higher education and non-profits. She also is a collegiate adjunct instructor teaching courses in Mass Media, Digital Culture, and Professional Writing.